Image caption The attraction was popular with children and tourists who visited the Brecon Beacons. The sword, which was fixed to the stone with cement, went missing on Saturday. Brecon Beacons National Park Authority said no-one had been arrested. Powys councillor Emily Durrant said the council was "pretty convinced" it was nobody local, and they had "suspicions" about a group that visited the lakeside that evening. Image caption A local photographer, Adam Tatton-Reid, has set up a crowdfunder to replace the sword. 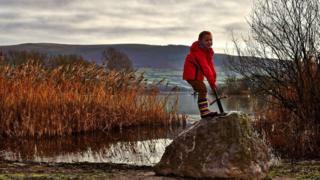 The iron sword placed in a stone was a popular tourist attraction, with people visiting Llangorse Lake using it to pose for photos. One of the locations mooted for Camelot, in the legendary tale of King Arthur, is in the Brecon Beacons, and as a nod to this the sword was placed at Llangorse Lake near Brecon. Garnett Davies, owner of the Lakeside Caravan Park and boat hire at Llangorse Lake, who installed the sword in the stone, told Radio Wales he had gone to open up the viewing centre on Sunday morning and the sword had gone. Mr Davies told Radio Wales local photographer Adam Tatton-Reid, who used a photo of the sword for a Brecon Beacons national park brochure, had started a crowdfunder to raise money for a replacement sword if the original was not found. Mr Davies has been "amazed" by the response, though ideally would like the original one back as it was crafted specially by a blacksmith and cost several hundred pounds. County councillor Emily Durrant said the community "really misses it." and is using the FYI Network for Talgarth on social media to encourage the thief to return it. The local community is also encouraging people to return the sword via social media messaging.